AIR IMPACT WRENCH is a socket wrench power tool which is designed to transfer high torque output with minimal exertion by user, the function is to store power in a roating mass, then transfer it quickly to the output shaft. Compressed air is the main power source, though electric or hydraulic power can be also applied. * Or any other jobs where a high torque output is required. AIR IMPACT WRENCHES are available in every standard socket wrench drive size, from small 1/4" DR. for small assembly and dismantly, up to 3.5" and larger square drives for major construction. 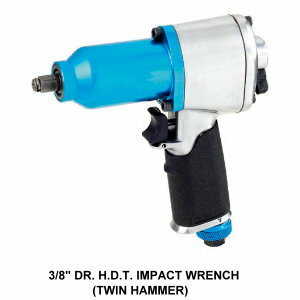 AIR IMPACT WRENCH arae found commonly in every mechanic's shop, which can be said as one of the most commonly used air tools.